Where won’t you find an ad these days? Ever considered the limits to advertising space? How about what it’s like to be confronted with a promotion when you’re least expecting it, perhaps out of context? A few years back on an editor’s blog (which frankly gave me way too much licence and isn’t there anymore – or I’d link to it) I wrote about using the names of wi-fi networks to advertise. I got the idea after coming across some creative naming near my home. A less-than-subtle SSID read ‘PRIVATE – KEEP OUT’. It wasn’t password protected. I suspect the owner did well to spell ‘private’ correctly, though probably was all SHOUTY in real life. Another had the owner’s name in it, which is bad juju in security circles. And finally I started seeing them for cafés but with something akin to ‘Pete’s café – 20% off’. I’m sure Pete was snappier than that but you get the idea. Recently this got me thinking about other places people are advertising – or at least, in modern parlance, placing a call to action (CTA). Today I heard about (via @PSFK) laser-etched messages on raw beef (cue comments about “having the digital chops” for that type of thing). But more relevantly for the kind of thing I normally write about (What? No more butcher talk?) is the idea of using a Facebook header – or something similar like the massive Google+ masthead or your Twitter page background – for conversions. The people at eZanga explain more in Optimize Your Facebook Cover Photo for Conversions. But the wider point is that there are so many places to put an ad that you have to work out what is appropriate and effective. Just because something can carry an ad, it doesn’t mean it should. 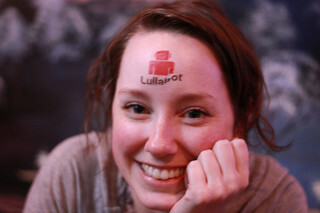 No corporate tattoos on foreheads, for example.